18K white gold AKILLIS Licence To Akillis bracelet set with white diamonds. Diamonds (cts): 0,77 A striking and timeless design redolent with symbolic power, LICENCE TO AKILLIS creations beautifully contrast the visual force of a target with their exquisitely fine settings. The rippling seven-row bracelet flirts with Art Deco, while the ultra-contemporary pendant earrings fall in a breathtakingly geometrical cascade. AKILLIS explodes classic jewellery design codes to masterfully cultivate a uniquely sophisticated approach to traditional French jewellery craftsmanship and instigate an all-new dynamic era in jewellery making. The whole AKILLIS range is an adrenaline-charged burst of creativity, allowing the wearer to blend it into their own personal style. This unique approach seduces those searching for bold yet irresistible charm, whoever they are and whatever their age. Expertly handcrafted in AKILLIS' Lyon workshops in French Jewellery best traditions by artisan jewellery makers, each piece radiates with uniqueness. Traditional manufacturing processes such as lost-wax casting are used alongside the most advanced technologies, as water jet polishing machines. Besides mere technique, acquiring the right level of sensitivity for the workmanship requires hours spent alongside experienced craftspeople. 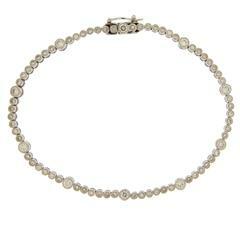 Chic bracelet embellished with diamonds and set in 18K white gold. 72.00 carats of round diamonds, F-G colors, VS clarity.